What I love about the classes with Senô sensei, is that I always learn new ways of doing what we do. Like all the students who’ve been here for 25 years, I’m quite aware of the forms. What I still need to learn is hiding in the details. Life is about learning, and his classes are full of insights. The point of visiting Japan three times a year is to improve my abilities. 2. That we have to create a Fuyû (1), a point of suspension where uke is trapped by his own force. Senō sensei explained today that in a given technique “1, 2, 3” there is more than those steps. Between “1 and 2” , and “2 and 3” , there are numerous hidden technical points. Details that change everything, and make your Taijutsu effortless and powerful at the same time. The body reacts as a whole because distance, angles, and rhythm are trained slowly to become perfect. 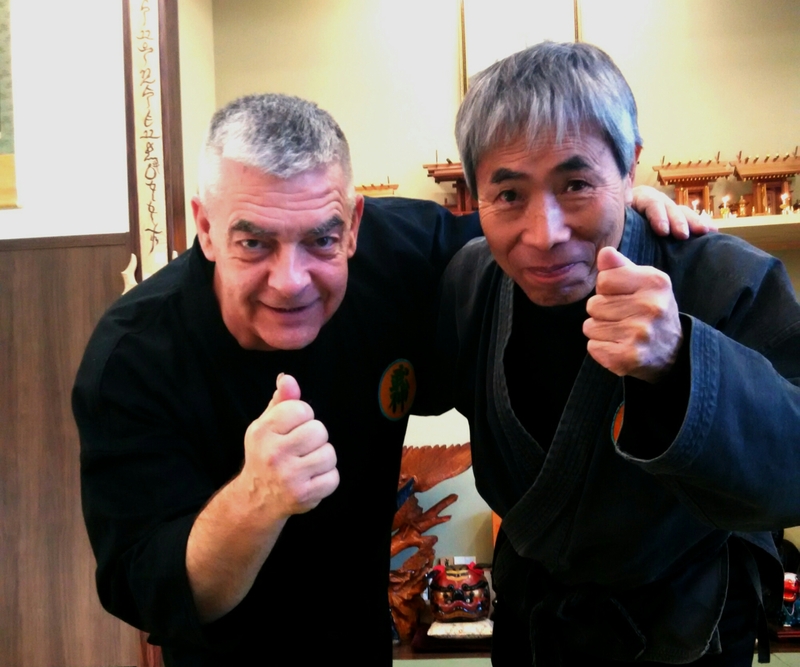 Like what has already been said this trip by Hatsumi sensei and Nagato sensei, it is necessary to move slowly in order to unfold the possibilities. His Uke attacked with a Gyokko ryû like attack. Right fist attack followed by a right kick. Senō sensei went back in line with the opponent’s fist, simply making a light contact on the hand. It was a simple double shuffling step in slow motion, that put him out of reach (Juppō Sesshō). The target being still reachable, this triggered uke to continue with the kick in the same side. Effortlessly, Senō sensei pivoted sideways, he spoke about Kosshi (2), and took the leg with his right leg. At the same time he was controlling the attacking hand by driving it, softly, to the left. This ended with uke falling on his back. From the outside it looked like uke stepped on a banana peel. It was simple and efficient. After a few tries, uke began not to give away his body weight and therefore was able to keep his balance. This is when details are everything. When this happened, Senō sensei would put the hand on his belt, turn close towards uke, barring the elbow with his right forearm. There was no grabbing, simply body pressure. We then spent a long time on this control. He explained that by rotating the bones of his forearm slightly, it was possible to get uke’s balance without force. It worked. I know that it might be difficult to visualize it, but I invite you to try it on the mats during your next training. Try many angles and hopefully you will understand it. Senō sensei explained that our body reactions should create a state of suspended gravity. When uke begins to think he is sorted by your body (technically, he thinks he is getting you), this is when you let go. This is the true meaning of Kokû (3). To persevere is not to resist but to be brave enough to go at the last possible second. This is the essence of Mutō Dori, the theme of this year. Positioning your body slowly at the exact distance, and at the last second, you create an in-between state. Uke is unaware that he is losing his balance and uses more strength to recover it when he sees it to late. Senō added that we have to play (Asobi) with this Fuyû feeling. But when you look at the kanji you discover that Fuyû is composed of “Fu + Asobi”, float + play (5). In baseball, Asobi is “to intentionally throw a ball to lower the batter’s concentration”. This is exactly what Senō sensei wants us to do, lower the attacker’s concentration by creating a state is suspension. Next Post 10th Dan To 13th Dan In A Minute!